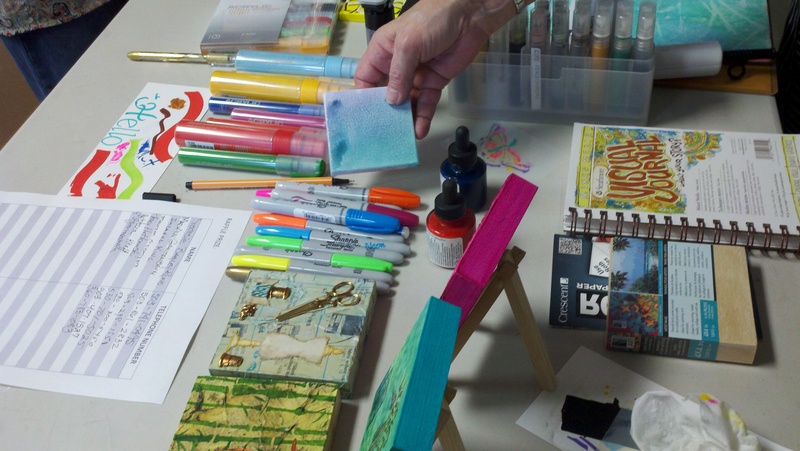 Come and join us at Dots ‘N Doodles Art Supplies on Saturday December 3rd for a fun mixed media Open House. We will have some fun products to play with and some of our vendors will be on hand for questions and answers. There will be free samples and door prizes. Call us at 503-325-5081 for more information. Watch demonstrations and find out more about products that might interest you. Add to your mixed media ideas. It will be a fun day at Dots ‘N Doodles and we will be offering a store wide discount also. One of the new exciting products will be Johanna Basford Coloring Canvases and markers. Some of your favorite scenes from Johanna Basford’s inky adventures have leapt off the page onto ready-to-hang artist-quality canvases! Explore all of Johanna’s worlds from the Secret Garden to the Enchanted Forest to the depths of the Lost Ocean. Each canvas features an intricate original design printed on 8 oz. primed cotton that is stretched around an acid-free paper board and a 3/4″ deep pine frame. Pair Johanna Basford coloring canvases with sets of coloring markers, pens or paint for a truly creative experience! Combine vibrant and easy flowing inks with dual nibs. Perfect for coloring on canvas, paper, art board and many other surfaces. These professional quality alcohol-based ink markers compliment the Johanna Basford Coloring Canvas series which are available in 5 color sets. The markers are quick drying, non-smearing and feature both a brush and a bullet nib for easy filling and precision coloring. This entry was posted in Featured Event and tagged card making, crafts, gelli plates, mixed media, Open House, pens, stamping, stencils. Bookmark the permalink.